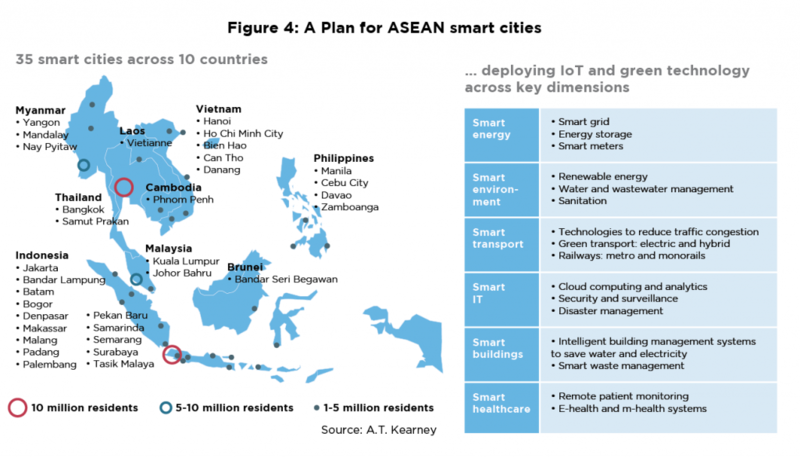 ASEAN in the Digital Age: Quo Vadis? Home / Publications / Advancing ASEAN in the Digital Age / ASEAN in the Digital Age: Quo Vadis? Technological advancement, enabled by our emerging digital behaviours and the new business models that deliver economic value, has brought us to the cusp of the digital age, impacting all aspects of human life. Over 90 percent of ASEAN’s population is literate5 and more than 50 percent of the population is under 30 years of age6, most with internet access. This young population is likely to drive the digital push in three ways: digital innovation, growth in digital spending and the economy, and accelerating digital adoption in the workplace. In 2015, the AEC mapped out a clear charter for the next 10 years with a clear focus on innovation and technology adoption, and the development of micro, small and medium enterprises (MSMEs)7. This is especially critical in ASEAN as MSMEs contribute 30-60 percent of the overall economy across markets (for example: in Malaysia it is 35 percent, Indonesia 60 percent8), but have low ICT adoption rates (for example, only 30 percent of SMEs in Malaysia using eCommerce and epayments9). This twin focus on innovation and MSMEs could spur wide spread digital adoption across the region. Countries are already taking concrete steps to bring SMEs online – KOMINFO in Indonesia organized programs with employee training and provided domain IDs and free hosting services in order to bring 100,000 SMEs online and help them expand their market reach, nationally and globally. There is also a plan to take 8 Million SMEs online through the Go Digital Vision 2020 program. Substantial digital and physical infrastructure investments have also been underway. Over 2011-2015, almost US$50 billion10 was invested in building communication infrastructure across ASEAN. For example, Malaysia has taken the lead by setting up the first Digital Free Trade Zone in the region to facilitate SME integration with the digital economy. Most ASEAN countries have articulated various visions for their digital economies, such as detailed eCommerce roadmaps that integrate SME sellers into the digital economy. For example, the Malaysia Digital Economy Corporation has developed one such roadmap in partnership with A.T. Kearney, which envisions doubling the eCommerce growth rate in Malaysia. Overall, ASEAN has a conducive demographic, macro-economic, infrastructure and strategic environment for digital adoption that will spur economic growth among the economies. Limited workforce readiness for the digital age. Privacy & security concerns – that need to be addressed. Weak rural infrastructure: Rural parts of most ASEAN countries remain largely unconnected. In addition, more than half of adults in many ASEAN markets do not have a bank account.11 Where banking penetration is substantial, such as in Malaysia (81 percent), cash still dominates with 7 times as many ATM withdrawals as debit card transactions.12 While cash on delivery is being explored as a solution, digital payments will be key to creating a step jump in online transactions, which involves shifting a large proportion of unconnected and unbanked people online. Limited work force readiness for the digital age: The digital revolution could see the end of employment as we know it. Our assessment broadly indicates three types of impact on employment across sectors: job losses, job augmentation and job enhancement. Science, Technology, Engineering, Mathematics (STEM) graduates typically play a key role in driving digital innovation and can take up many of the ‘enhanced’ jobs. However, STEM graduates are under-represented in many ASEAN countries – for example, Indonesia produces ~750 STEM graduates per 1 million population, far below China (~1,000), and India (~1,800).13 Despite this, most ASEAN countries do not have a skills roadmap for the workforce. The absence of a coherent plan will hamper workforce development for the digital age. Privacy & Security concerns: In a recent digital transformation survey with business leaders in the region, cyber-security ranked as the top concern. Among consumers, there are increasing concerns around the security of personal data, financial and transactional data. Over the past few years many ASEAN countries have strengthened personal data and cybersecurity laws. But this will need to be continuously strengthened to enhance people’s trust. Continued investment in digital and physical infrastructure is a must. This will range from increasing broadband internet access and digital services, to enabling the creation of smart platforms and cities. Increased spectrum availability, especially of a lower band such as 700 MHz, so that operators can expand broadband coverage cost-effectively. Ensuring that there are no more than four mobile operators per country, so that operators can earn sufficient returns to re-invest in infrastructure. Countries could consider the rollout of a national broadband network to increase penetration of fixed-line networks and provide enhanced mobile quality. A single framework that enables countries to harmonise regulations on payments and mobile financial services will greatly bolster digital usage. Policy makers must encourage standardised digital payments platforms – first in-country, then across ASEAN. Systems such as NETS in Singapore or mobile wallets will lower the cost of transactions and encourage daily micro-payments. Further, significant acceleration is needed towards setting up and running Internet-only and payments banks. These limited service institutions are significantly faster and cheaper than traditional brick and mortar banks, enabling deeper financial penetration and ensuring the mass of transactions are digitalized. For ASEAN to fully benefit from the digital revolution, its people will need to be not just digital consumers, but also digital producers and innovators. Lazada, Grab and Go-Jek are some anchors in their respective markets that have shown how local success stories encourage digital entrepreneurship. Observing and learning from such local success stories plays a key role in accelerating digital entrepreneurship. True innovation requires all stakeholders from policymakers to companies to schools to play a leadership role. Local incubator programs and industry-university collaborations can turbocharge innovation through creating a nurturing environment through research programs, hackathons, and internships/education credits for industry work. Silicon Valley provides a great template for creating such an environment of universities, companies, and investors and demonstrating its positive flywheel impact. Some national initiatives focused on creating a comprehensive ecosystem for innovation are already in action through the SPRINGS SEEDS Capital and Startup SG Equity programs in Singapore and MaGIC (Malaysian Global Innovation & Creativity Centre) in Malaysia. In Indonesia, the Ministry of Communication and Information Technology has set up the ‘1000 Startup Digital National Movement’, aimed at creating 1,000 technology startups with total valuation US$10 billion by 2020. Regulations and enforcement to protect developers from those who seek to produce inferior imitations, adopting the “fast follower’ strategy, are paramount to digital innovation success. Studies globally have found that strengthening intellectual property rights increases the propensity to innovate and file patents. Positive regulation to encourage innovation zones as well as ‘short period moratoriums’ from regulation for new technology such as M2M and IoT can encourage development of new technologies and solutions. ASEAN could take a similar approach to advanced R&D markets such as the US and Japan to make extensive use of R&D tax incentives to help innovative enterprises get off the ground. Such concessions must be non-discriminatory, applying to startups in all industry sectors. For digital adoption to be widespread, trust and security is paramount. Most ASEAN countries have compulsory National IDs to access certain government services, but they should now implement a national e-ID system as a first step. With national IDs in place, ASEAN can then strive toward cross-border identification, resembling the European Economic Area’s adoption of national ID cards entitling people to free movement. As everyday services move online, the risk of a breach is high. A resilient regional-wide cybersecurity regime is needed to drive public confidence in e-commerce and cross-border data transfers. ASEAN should consider creating a world-leading agency to fight cybercrimes, like J-CAT of Europol. However, regulations need to be balanced and proportional to avoid deterring businesses from developing electronic and mobile commerce platforms. For ASEAN to take full advantage of the Digital Age, its workforce need to be imbued with the right skill-sets. Countries should lay out a comprehensive roadmap for talent development and training. Reskilling and retraining should focus on enabling employees to use technology effectively, fostering curiosity, creativity and collaboration to prepare for a world of continuous disruption. Tighter coordination between Government, Industry and Educational institutions is necessary, with a focus on the practice aspects of digital, and the latest tools and technologies. The Thailand 4.0 model is an example of Government action in this space. The government is promoting lifelong learning through 3,600 community digital centers and is Nurturing Citizens 4.0 by setting up a Strategic Talent Center where they match specialized science and technology skills with private sector needs. Overseas nationals represent an immediate opportunity to boost the existing local talent pool. Governments should be doing all they can – from financial inducements, to preferential taxes, or other incentives – to attract highly-skilled overseas workers to return home to ASEAN. 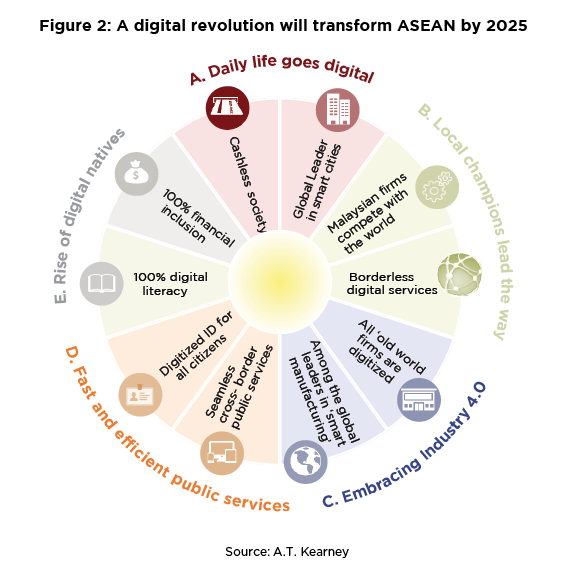 Set up an independent board — the ASEAN Digital Economy Promotion Board to provide strategic direction and guidance to the AEC and its member governments – with country representatives, industry experts and key opinion leaders. Set up a Digital Index like the European Union’s Digital Economy and Society Index (DESI) that collates relevant indicators on digital performance and tracks the evolution of member states’ digital competitiveness. Rome was not built in a day and neither is a digital economy. The headwinds outlined must be addressed with all stakeholders working together, pushing for an integrated roadmap that will turn the US$1 trillion opportunity into ASEAN’s reality. A.T. Kearney is a leading global management consulting firm with offices in 40 countries. Since 1926, we have been trusted advisors to the world’s foremost organizations, working with more than two-thirds of the Fortune Global 500. A.T. Kearney is a partner-owned firm, committed to helping clients achieve immediate impact and growing advantage on their most mission-critical issues. 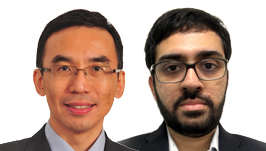 About the authors Soon Ghee Chua is a partner with A.T. Kearney heading the South East Asian operations. He has almost 20 years of consulting and industry experience during which he has advised Business and Government leaders across the region on digital and transformation related topics. He has also co-authored a book on ‘Asian Mergers & Acquisitions’. Hari Venkataramani is a principal with A.T. Kearney based in Singapore. He has extensive experience advising organizations across Asia-Pacific on digital and transformation related topics.